Clearing out a house after death is a sacred act, yet no amount of holiness assigned to this task can dismiss the back-breaking, shoulder-aching, neck-craning job of sorting, recycling, and passing on to others the possessions of a loved one. Aside from clothing and furniture, Mother left behind the tools of her trade in the kitchen along with beloved books of our childhood, some of which are displayed here. 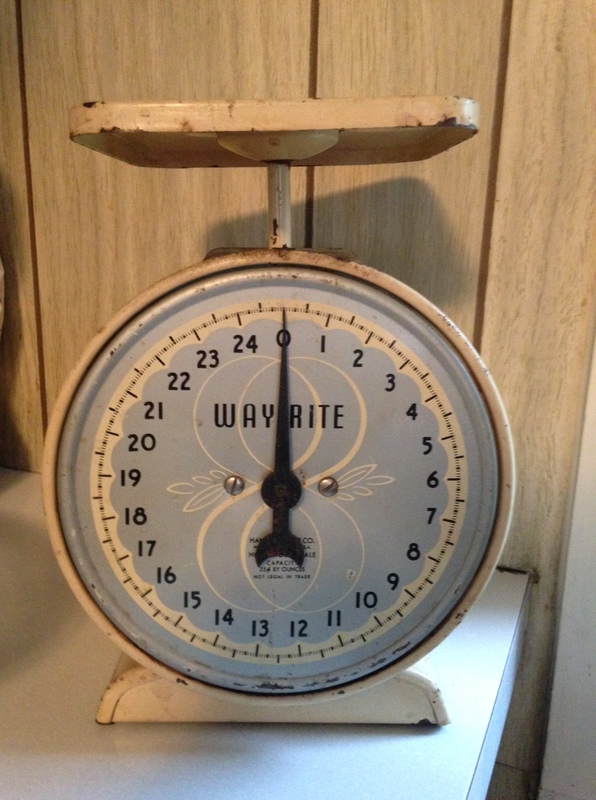 What remains: A scale on which all of our baby weights were noted and recorded (or ingredients for recipes measured), cooking utensils, ice cream dipper, and juicer, most of which have been passed on to grand-children. My best guess is that these were wedding gifts or first (and only) time purchases. I don’t remember another scale, a different set of utensils, a second ice cream dipper or juicer ever passing through the threshold of our home. The throw-away mentality of our current consumer society never made sense to Mother. “You buy good, and keep it – for a lifetime” was her philosophy! Yes, prepare food and serve it, and with love! Her fancy china set, sterling silver flatware, and crystal glasses and goblets all have found homes with her grandchildren. 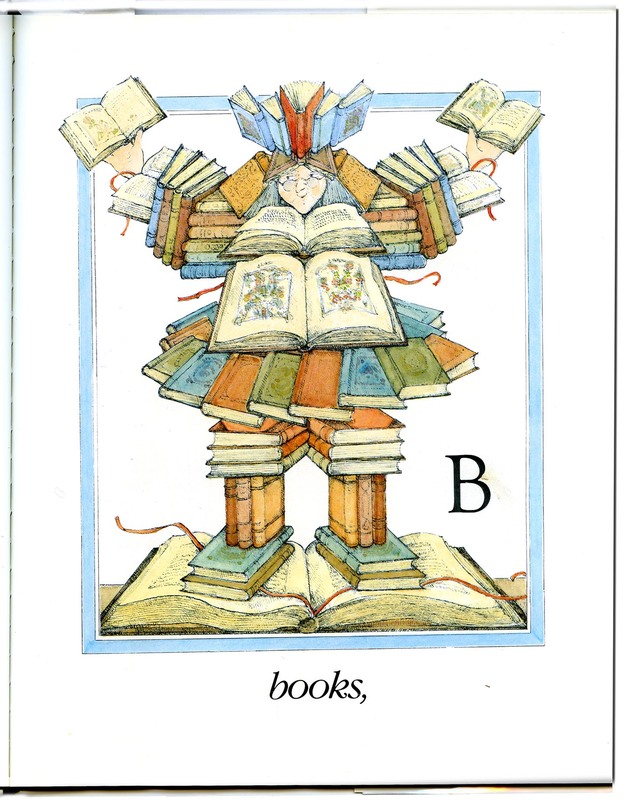 In previous Moments of Discovery, you may have seen other books from Mother’s bookcase or from the attic. The book below, a reader, is certainly a keeper, recording media and methods that are becoming obsolete. 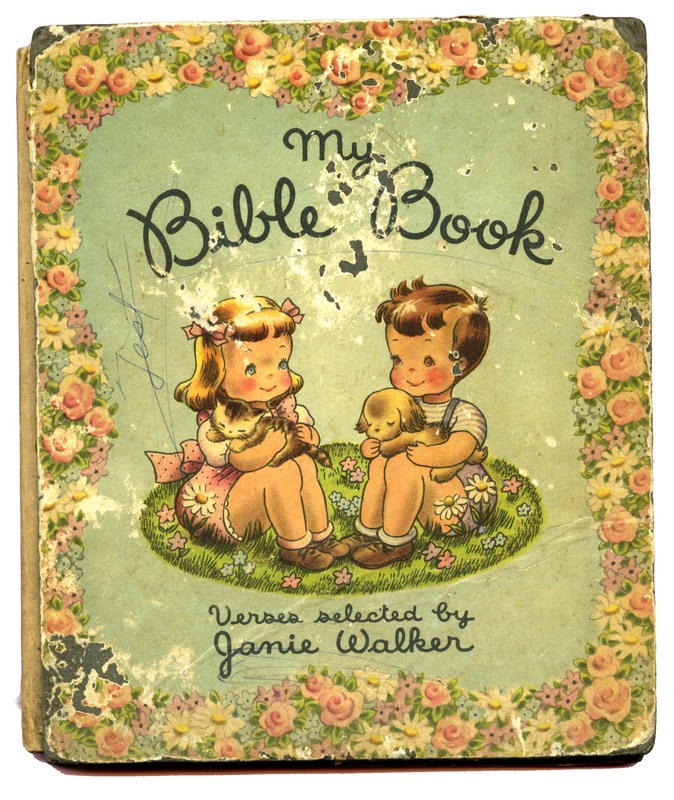 And one of my favorites is My Bible Book with verses selected by Janie Walker and pictures by Dean Bryant (Rand McNally and Company, 1946). These words and pictures have been imprinted on my childhood memory as I joined the red-haired boy and blonde-headed girl roaming around gardens and romping through meadows with their pets. It was a perfect world! Aunt Ruthie gave me this book with penciled instructions to read it to my sister Janice, show her the pictures and tell her all about them. Ever the teacher, she closes with her sweet lead-in question: “Can you tell what each picture means?” This is probably a Christmas gift or birthday present given to me in 1948. 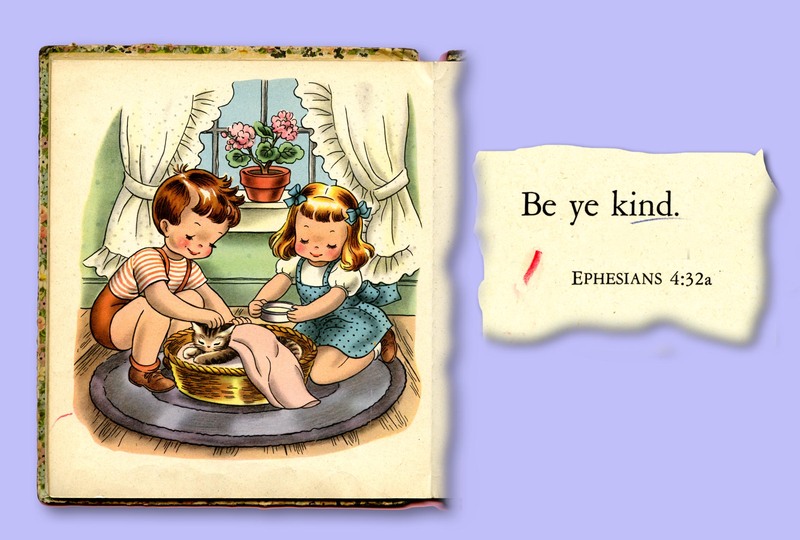 Puppy dogs, a frog, a snowman, a kite, some birds, squirrels, a herd of cows, and a even a special kitty cat amuse the children as the pages turn with words of wisdom all quoted from scripture. 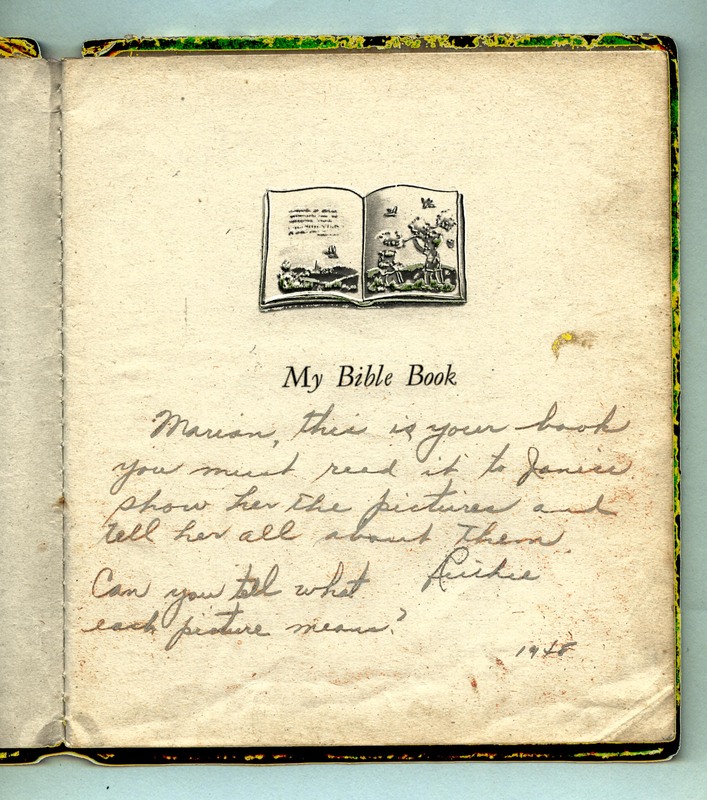 Do you have old books in your treasury of keepsakes? 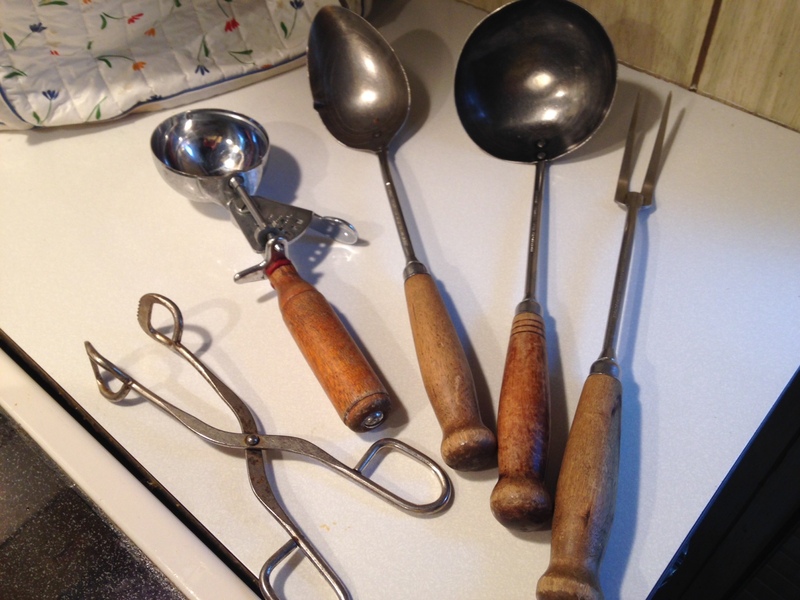 Some special utensils for cooking or serving passed down to you from a generation or two ago? We’re all ears! Coming next: Button, Button, Who’s Got the Button? Lovely mementos! I have some of my parents\’ things that are special to me, and I am also the family repository for the historical documents they left. I often wonder who will take them over after I am gone. Hi, Linda. I wonder whether you are the oldest daughter. Often that rank in the family order gets to serve as the \”family repository\” – ha. I hope someone in the next generation will keep the your relay of history documents going. Thanks! No Marian, I am the middle daughter and the middle child of five. Nobody else has any great interest, I\’m afraid. One of my sons is a keen family historian, but mainly on his father\’s side & these are from my side. Oh well! Maybe that keen family historian will turn his sights in your family\’s direction one day. There\’s still time, you know! What a lovely post, Marian! It is so wonderful that you and your family have these items –and what\’s more, that you treasure them, not only for what they are, but also for the memories they hold. I imagine as you turn the pages of that book, you see you and your sister and picture your Aunt Ruth\’s voice saying the words of the inscription. Your daughter-in-law will have a memory of your mother every time she scoops some ice cream–and something to tell her children, too. My sisters and I discussed what to do with the jello mold we found in Mother\’s things, I remember. However, we ended up putting it on the sale; I think one of us may have kept it if it were ceramic, and not plastic, but who knows. I wonder if that ceramic squirrel mold has ever made it into your writings. Hmmm! 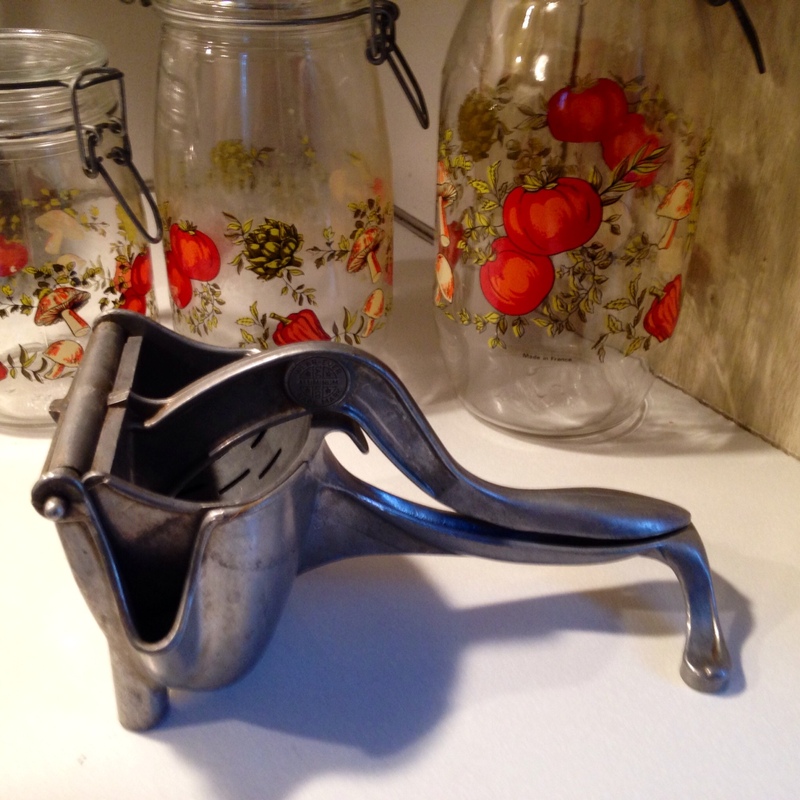 I would pay good money for an old ice cream scoop like that, just like my Dad\’s, and it was precious and protected–he didn\’t like it to end up in another drawer where he couldn\’t find it right away. 🙂 Somehow it was Dad\’s job to dip the ice cream. (He did not do much in the kitchen until he quit farming, then he\’d wash dishes!) Your little copy of \”My Bible Book\” is one we had too. So precious! My dad\’s presence in the kitchen was very scarce until he hit the 60s although I have a photo of his drying dishes and Mom washing when they were a young couple. Believe me, when we three girls were old enough for kitchen duties, he stayed away. My BIble Book is very fragile. Now that the pages have been scanned, I hesitate to open it – the binding is so thin. 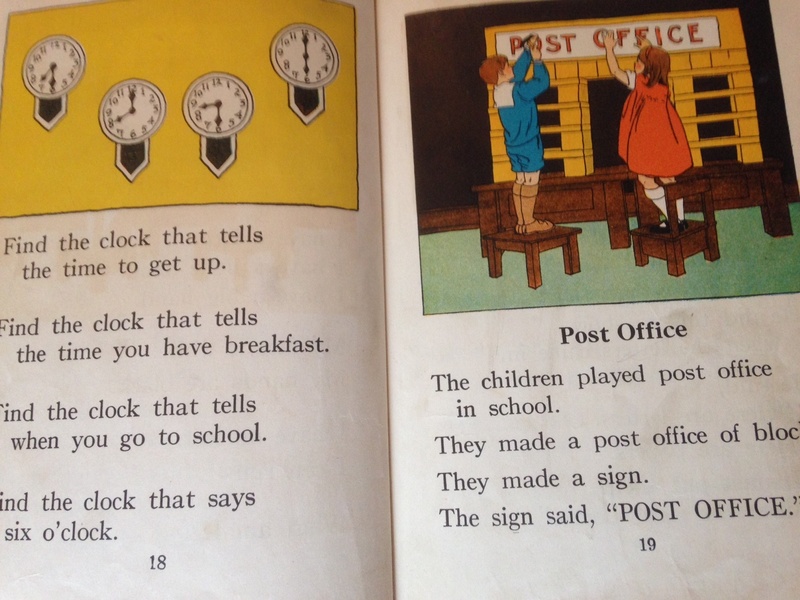 I wonder how many of these books are still in circulation or boxed up in people\’s attics. The artwork is so charming, and specific to that era. Again, thanks for adding your memories here, Melodie. These items are all so special. So pleased they have been passed on. We have been passing on some of mom´s things too as she is now in a nursing home. Pleased that the younger generation appreciates them. I just gave some old pictures to my kids. Our parents did not like the throw away mentality either. What a lovely post. You are fortunate to have so much so well preserved. I think I have a glass paperweight with birds in it from my grandmother. We moved around a lot. There\’s a ceramic swan that belonged to my mother (Avon, I think), and a few dishes that managed to remain unbroken over the years. Oh, I think I remember that Avon swan, clear plastic and attached to the cap on a perfume bottle – well, maybe! At least you won\’t be accused of being a hoarder, Susan! Ouch – hope you\’re not insulted! Never, Marian. Avon put out some pretty stuff and some cheap stuff too. HA! My dad had dozens of bottles of cheap cologne in cars, horses, motorcycles. A baby gift from my mother that at first mystified me but I learned couldn\’t do without was a scale. I was skeptical about its accuracy, but then I was so grateful to have it and used it every day to confirm my baby was healthy and growing. One more thing, that scale was accurate as the doctor\’s office teaching me subtly what mothers know and pass on is pretty spot on. Thanks for your lively example and the conclusion about mother\’s wisdom. Well, we knew it all along, didn\’t we? a good way to keep them. Hoorah for the Hurst scrapbook! Knowing the approximate ages of your grand-children, I can imagine them helping you insert the photos. A keep-safe and also a keepsake! “You buy good, and keep it – for a lifetime” I LOVE this quote from your mother. We could all learn from that one. I just love this post Marian and your reminding us of the things we leave behind to be found by those who find delight in them. Most of the items you see here we knew about, but there were some surprises for Mom\’s grandchildren, including the china pattern. Gosh, it\’s so good to see you here. Wishing the best for your final writing edits — and your family\’s health, Joan. Actually, I have the same philosophy – more or less, even down to the recycling of aluminum foil. I have the frugal/thrifty bug from both angles; Mennonite, and with Depression-era parents. Thanks for lending your thoughts here once again. I appreciate it, especially since I know you must be tired out from school and paper grading. I loved reading and seeing the pictures of your mother\’s things. My sister and I went through our mother\’s things while she was still living but moving into an apartment so she told us many stories and it made her things seem so much more valuable, at least to me! My sister is gone now, but I have many of Mother\’s utensils and dishes and baby clothes and pictures, etc. I guess there are advantages and disadvantages to both ways of dispersing of the possessions of a loved one: before or after a change in address, Mother\’s now in heaven. Of course, I wish I had had more time to talk about her things and hear more stories. Marian — You never cease to amaze me at the numerous heart-based items you have on hand that hold countless wonderful memories! I particularly resonate with your mother\’s wisdom: \”You buy good, and keep it – for a lifetime.” So while I have few material items, they\’re all well-crafted and meant to last. You preach it – you live it, Laurie! Minimum stuff, maximum enjoyment. Marian — Now THAT was a great fortune cookie! Such amazing treasures Marian. Your mum was a wise woman and it seems she had passed her values down to her family. My mum left me many things , the joy of reading is one I will never be able to thank her enough for . She also had a great interest in film stars of the 20th century. She passed to me a collection of \’Picture Goer \’ annuals , do you you remember them ? No, I haven\’t heard of Picture Goer annuals. I wonder what the US equivalent would be. Maybe a movie feature edition of People magazine. I love your reminding me of the expression \”toes curl.\” Your Mum gives you precious memories, as does mine. Thanks, Cherry! 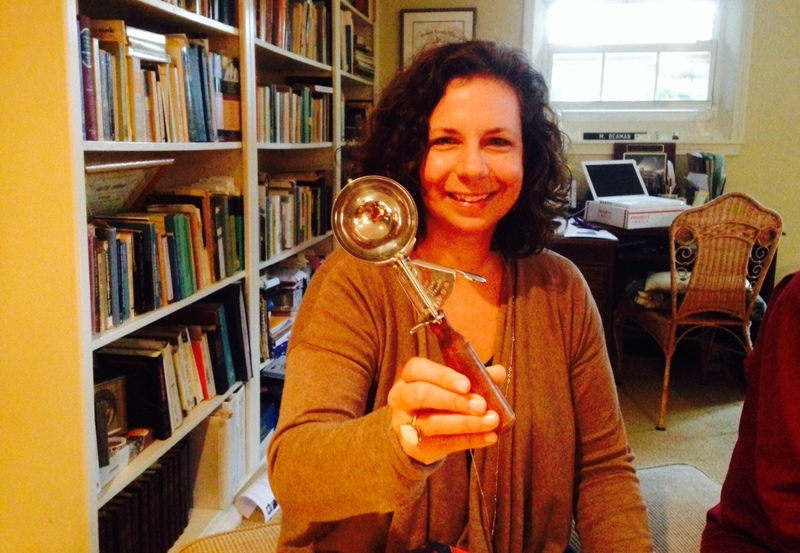 Now that\’s a nice cream scoop! If I had one like that, it would be a keeper. The Bible Book is so sweet and I love the illustrations. My favorite keepsakes from my grandmother are an apron, handwritten cookbook and embroidered dish towels. Although I don\’t use them, I keep them in a drawer in my kitchen. They bring back such good memories of her and the meals she used to make. How interesting that both of our keepsakes (aside from the books) have to do with food. My Mother, probably like your grandmother, equated food with love. Thanks for popping up again here – appreciate it, Patti. It\’s sad work – but I\’m glad you found some good memories. Grief and love are a package deal, as a good friend said. Mother passed on the love too! I ironed my dress today on mother in law\’s old ironing board and I live in my parents old house. We seem to have been clearing my father in law\’s house forever but it\’s finally done now and it feels sad to say goodbye to it. There was an urgency to get Mother\’s house cleared out because we had a buyer for the house. My sisters and I worked day and night it seemed after the funeral and then about 3-4 weeks in separate spates after that. It was a bittersweet task, the last act of love to honor Mom. (Oh, my aching back!) You say \”it feels sad to say goodbye to it.\” I can relate in that when we drive by the house, we can\’t go in – somebody else lives there now. It\’ will seem so strange. Your emotions and discoveries remind me of those of my own family as we go through my grandmother\’s house, which has to be sold soon. Thanks for sharing them! We are on parallel tracks in some ways though a generation apart. It\’s nice to see you here today. Thanks for stopping in, Rebecca. I\’m glad I have the opportunity to hear your story, not to mention see your pictures!